The polyvinyl alcohol (PVA) and magnesium oxide (MgO) nanocomposites and (PVA–MgO) nanocomposites doped by Silicon carbide (SiC) nanoparticles have been fabricated with different concentrations of Silicon carbide and (PVA–MgO) nanocomposites. 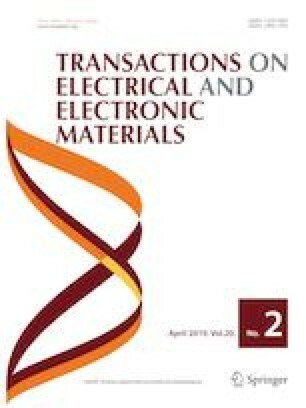 Both experimental and theoretical studies on structural and optical properties of novel (PVA–MgO–SiC) nanocomposites for humidity sensors were examined for first time with low cost, flexible and high sensitivity. The (PVA–MgO–SiC) nanocomposites were intended with various concentrations of Silicon carbide nanoparticles. The experimental results of optical properties for (PVA–MgO–SiC) nanocomposites indicated that the absorbance, absorption coefficient, extinction coefficient, refractive index, imaginary and real dielectric constants and optical conductivity of (PVA–MgO) nanocomposites increase with an increase in Silicon carbide nanoparticles concentrations. The absorbance increases from 0.432 to 2.55 a.u while the transmittance decreases from 0.779 to 0.230 a.u. The energy gap decreases from 4.4 to 2.1 eV. The energy gap theoretically decreases from 7.07 to 3.04 eV. The experimental results of novel (PVA–MgO–SiC) nanocomposites applications showed that (PVA–MgO–SiC) nanocomposites have high sensitivity for relative humidity. The results obtained were compared with theoretic results obtained by using Gaussian 09 program and Gaussian view 5.0.8 program and using density functional theory (DFT) at B3LYP level with 6-31G basis set. The authors thank the University of Babylon–Iraq (College of Education for Pure Sciences, Department of Physics and College of Science, Department of Physics).